Our painted and mango dressing tables are a great way to complete your bedroom style. You deserve a space in your bedroom dedicated to true self care. And we can’t think of anything better than our selection of mango wood and painted dressing tables. And while you’re at it, pamper yourself with a matching mirror or stool to complete the set, and make a peaceful place to get ready for the day. These dressing tables are available in either exotic mango wood with a natural wax finish, or gorgeous smooth creamy painted colours that nicely complement the rustic and natural wax finished solid oak tops. Dressing tables are the perfect way to give your room a refresh while also making a statement with their unique styles. 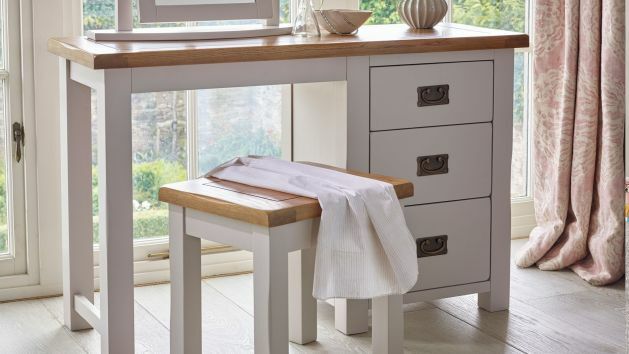 Browse below our selection of painted and mango dressing tables!